It's Tuesday...so let's make it a Tombstone Tuesday! 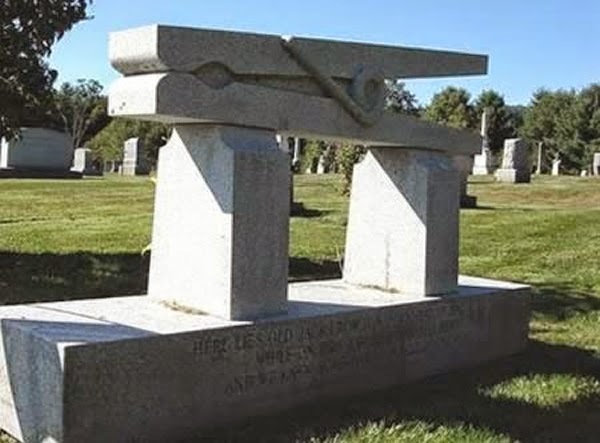 Instead of the usual 'ghost story' or haunted location, let's just take a look at a VERY interesting symbol of one Vermont man's lasting legacy! W. Jack Crowell was born on August 6, 1924. He made his career in the clothespin industry; in fact, he owned the National Clothespin Factory of Montpelier, Vermont. The National Clothespin Factory opened in 1906 and continued manufacturing wooden clothespins until 2009, making it the LAST American company to do so. Apparently, Jack really loved his job, because when he died on October 20, 1996 his family erected in his honor a giant clothespin tombstone! It is said that original plans for the tombstone were to include an actual spring so that children visiting the grave could play on the marker, just like a see-saw! Although there is unfortunately no playing on the tombstone allowed, many people still flock to the Middlesex Center Cemetery each year to view the unusual tombstone.